This is the electrical version of Beta vs VHS. This plug can fit both our parallel style plugs and Tandem plugs. 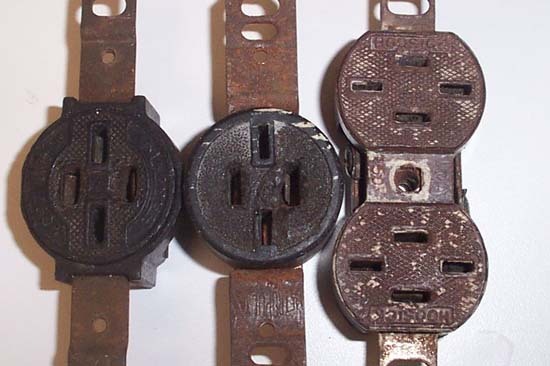 The parallel style plugs are the type we use today. The un-grounded type like you would find on a lamp can still operate in an outlet like this. The Tandem style plug has two horizontal flat blades. They fell out of favor in the early part of this century. The tandem parallel combo outlet was still sold in store up to the 1960. The combo tandem and parallel outlet is now at least 60 years old. In most cases they are over 100 years old. These types of devices are probably original to the home. The wiring behind the wall would then have to be cloth knob and tube un-grounded wiring. Knob and Tube wiring is out dated. It should be replaced. Now, that we know some of the history of this style of plug. The next question is what to do when you locate them in your home? Remember that electricity is the safest way to transmit power to homes. That is why we no longer have gas lighting. There still is a problem when your electrical system gets neglected. Not replacing old equipment can become dangerous. Plugs and switches should be replaces ever 20 to 30 years. 6. After you make all the above safety check start to put together a plan to rewire the older knob and tube circuits. I had few of these outlets in my house when I first bought it, and I didn't even use them because I didn't know what they were. It wasn't until I started doing the renovations and I brought an electrician in here for the rewire and he told what they were. I think internet is the only way which keep you updated about different diseases and what happening in the health and sciences fields. In this way this is boon not the bane but proper understanding is possible only if information is written in readers friendly method. I am pleased to tell you that now you can get services of write essay online on this website which is satisfying people all over the world. The 4th photo down I took. The outlets are from a rewire I did on a house in Compton CA around 2000. I dunno how that photo ended up here ? This seems like it was posted by a person who doesn't know what they're talking about, or an electrician who's trying to scare the uneducated public into needlessly hiring the guild. 1. Knob-and-tube (K&T) wiring is perfectly safe if the insulation is still ok, if the porcelain knobs and tubes aren't cracked, and if someone didn't mess around with it. In fact, good-condition K&T is SAFER than modern wiring practise, because the connections are SOLDERED (not clamped with those awful twist-on "wire nuts" / Marettes). 2. There is nothing unsafe about an ungrounded receptacle. The CONDITION (not the receptacle itself) only becomes unsafe when someone attempts to plug in an appliance designed for a grounded connection (ie. an appliance having a 3-prong plug on its cord). But for appliances that do not need a ground connection (ie. having a 2-prong plug on the cord), ungrounded receptacles are perfectly fine. 4. Assuming the idiot meant "receptacles" (instead of "plugs"), there is no blanket rule that they should be replaced every 20 - 30 years. While receptacles and switches do wear out a very small amount, their actual lifespan depends on how many times a plug is inserted and removed or how many times the switch is flipped. Assuming no corrosion problems (which for a well-maintained home is almost never an issue), a receptacle rarely used or a switch flipped only a few hundred times is still perfectly fine, even if it's over 100 years old. Because with such little use, there is very little wear, and its condition will still be very close to "factory-new". 5. Needlessly replacing built-in electrical parts far more frequently than necessary is actually bad for the electrical system and makes it MORE DANGEROUS! Every time a switch or receptacle is replaced, the wires in the wall get flexed and stressed. Eventually the insulation crumbles, and the metal conductor inside develops little cracks (ESPECIALLY for aluminum wiring!) which increases resistance, increases temperature, and increases fire risk. DON'T FIX IT IF IT AIN'T BROKE!!! 6. I really, Really, REALLY hope that whatever electrical authority that licensed whichever electrician who wrote this article, is reading this article... and revokes said electrician's license. The author's terminology is incorrect (which can lead to disastrous interpretation of their "advice"), the author's logic is flawed, and what the author recommends is baseless, deceitful, and DANGEROUS! The author is obviously NOT someone who should be carrying a license to touch anything electrical! The ONLY "correct" information in this article is that if the electrical apparatus is damaged (cracked, chipped, burned, etc.) then it should be replaced. Dear Anonymous. Knob and tube is obsolete, and DANGEROUS. Open air conductors, and the absence of grounds put homeowners at high risk of shock, and fire. File knob & tube in the same file as solid core aluminum wiring. We've learned a lot since homes first started using electricity. The ground is there if the neutral FAILS. It is the back up safety net for the device and circuit. And YES, devices need replacement over time. They corrode, they wear out, and they break. So Dear Public, the (irresponsible, erroneous) thoughts above are an opinion from someone who is uneducated about electricity, and modern electrical system safety features. Any knowledgeable, caring licensed electrician would tell you the same. Wayne, please return your license; your are obviously not qualified enough to deserve it. I don't care how "knowledgeable" you think you are just because you fraudulently obtained an electricians license; I trust the ELECTRICAL ENGINEERS who have the knowledge (and authority) to DEVISE the actual standards, and DESIGN the actual equipment you electrians are merely only trained to install. K&T wiring has another safety benefit over contemporary wiring: The wires are supported at some distance from the timbers, so if there is an overloading fault and the wire overheats, it has less chance of igniting the timbers and causing a fire compared to contemporary wiring when its overloaded. 1. K&T was rather expensive and time-consuming to install. 3. Retrofitting K&T required considerable re-work; the wires were installed under tension, so any changes required re-tensioning all the affected wires, and all the solder joints had to be made very secure. Quality workmanship wasn't just desirable -- it was necessary. Wrong, wrong, and WRONG. 1.) It WAS discontinued for safety reasons. Do you think one day people said "Oh, lets add a ground wire just for fun". 2.) Knob and tube is NOT confusing; it IS color coded, (BLACK hot conductor covering, and WHITE neutral conductor covering). Any licensed electrician or knowledgeable home inspector with a $5.00 tester can figure out the hot and neutrals and if it is still active. 3.) Quality work and specified materials are MANDATED in modern electrical systems. Sloppy and wrong? You FAIL the inspection. Oversight was basically non-existent before modern codes became law. Knob and tube was banned over 50 years ago and for good reason. Anyone in the attic of a live knob and tube home is at very high risk of electrocution, especially when sweating. It is old, often in poor condition, or hidden below insulation. It will also likely cost you a lot more to insure a home with it, if you can find an insurer (and lender) who are agreeable to allow it to stay. I say GET RID OF IT. (I have inspected many homes with it, I know what I am talking about). And when you do, have all of it pulled out, wherever accessible, including the insulators. While retrofitting can be a bit invasive, wall can be repaired. Dead people cannot. Wayne, you obviously have never touched K&T wiring. Both the Live and Neutral of K&T were black. (The black=live, white=neutral convention only became commonplace after modern "Romex" (TM) style wire (with Live+Neutral+Ground all bundled in the same outer jacket) was introduced. And yes, any KNOWLEDGEABLE electrian can test which wire is Live and which is Neutral... but I have come across many electrians (which I suspect have just as much education as you) who STILL GOT IT WRONG and screwed-up the polarity when retrofitting new branches to existing K&T! And I'm deeply concerned at your claim that "Oversight was basically non-existent before modern codes became law..." Tell me, in which geographic area do you live? Because in my area, even K&T was subject to inspection before the project could be considered finished and ready for the customer. (If your local legislation did not have this even in the early days, I shudder to think how retarded (dictionary definition of "retarded") your legislation may STILL be these days.) Remind me to never live in your jurisdiction, where "electrians" are still given licenses when they still don't understand basic circuit theory. Moving on... and addressing your claim that "Anyone in the attic of a live knob and tube home is at very high risk of electrocution, especially when sweating. It is old, often in poor condition, or hidden below insulation." Well guess what chump -- That WILL become true even for modern Romex wiring, after many decades or a century or so from now when its insulation starts to break down too. That has nothing to do with K&T vs. modern wiring convention; it has to do with CHEMISTRY and the stability of the insulating material. You're most likely as of now doing the basic things to spare vitality, for example, turning things off when you needn't bother with them, however you might need to roll out more improvements to lessen your vitality utilization even more. Assuming this is the case, you're going to require the right apparatuses for the occupation. Some electrical plugs Thanks. Hi Everyone. Thank you for your feedback. The content of this post has been move to our new blog. Please stop by and comment. All three of these types of auctions exist online, however, the antiques auction online that we see poised for the most growth is the traditional type computer auctions online. Loren, Your comment was truncated. What is the four outlet receptacle called?